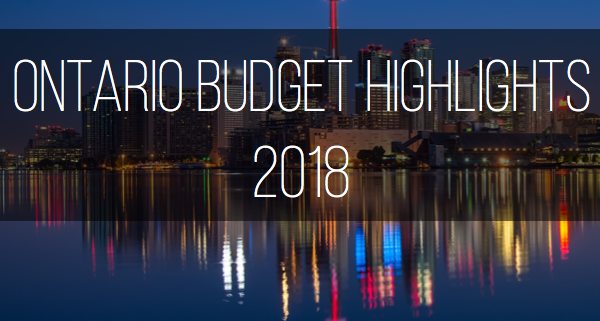 Ontario Budget 2018 – Alta Vista Planning Partners Inc.
A new sliding scale for personal income tax will be introduced, with seven personal income tax rates which will be applied directly to taxable income, in an attempt to eliminate Ontario’s surtax. The province estimates that approximately 680,000 will pay less tax as a result. Access to further education will be income linked, with those families with an income of less than $90,000 per year receiving free tuition and families with an income of between $90,000 and $175,00 per year receiving financial aid for tuition costs. Effective in the Fall of 2020, children aged two-and-a-half until they are eligible for kindergarten can receive free licensed child care. 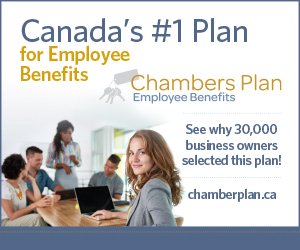 For those without workplace benefits or not covered by OHIP+, this program offers up to 4.1 million Ontarians a benefit that pays up to 80% of expense up to a cap of $400 for a single person, up to $600 for a couple and $50 per child in a family with two children, regardless of their income. The budget announces the introduction of free prescription drugs for those aged 65 or older, resulting in an average of $240 per year in savings per senior. 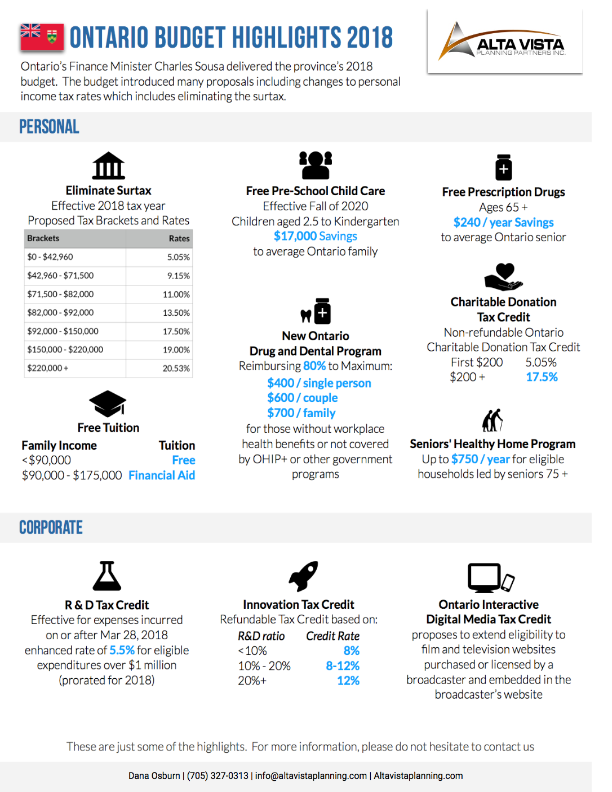 The non-refundable Ontario Charitable Donation Tax Credit will be tweaked to increase the top rate, remaining at 5.05% for the first $200 but increasing to 17.5% for anything above $200. $750 is offered to eligible households with seniors of 75 years of age or older to help them to care for and maintain their residence. The budget introduces a non-refundable tax credit of 3.5% on eligible costs relating to R&D, or an enhanced rate of 5.5% for eligible expenditures of $1 million plus. Note that this enhanced rate would not be payable to corporations where eligible R&D expenditures in the current tax year are less than 90% of eligible R&D expenditures in the tax year before. · If a company has a ratio of R&D expenditures to gross revenues of 10% or less, they will continue to receive the 8% credit. · If their ratio is between 10% and 20%, they will receive an enhanced credit rate of between 8-12%, calculated on a straight line basis. · If their ratio is 20% or more, they will receive an enhanced credit rate of 12%. Eligibility to receive this tax credit will be broadened to include film and television websites.